The Catholic people aren't completely at fault here. They just trusted their priests not even considering they may be lying to them. They have been taught since 538AD that their church is a Christian church and so they believe it simply because the priests say it is. And the norm in the seminaries is that the new priests are all brainwashed into thinking Roman Catholicism is in fact Christianity. So many of these priests are just as in the dark on this as are the people they preach to. But if they open the Bibles their church leaders declare in writing to hate, they would see what billions of other people see. Even the Atheist knows Catholicism is evil and this is why they gave up on God. At least that's what I have heard from some of them over the years. Still, the people need to open their Bibles if they are ever to understand any of this. The Catholics are taught to worship the priest over the Creator of that priest, and so as promised from the Lord Himself, a strong delusion has become their faith. But the main reason I am posting this article is why this priest did this in the first place. For this priest and many like him in the Vatican churches to claim the Nativity scene may "offend Muslims and Atheists" is the weakest lie to date. What they're going for here is a complete removal of Jesus Christ in all aspects of society. The fact the people have let them do this for well over a millennium confirms their end game agenda is known. And yes, they have allowed them to remove Jesus. But how you ask? One word… CHRISTMAS! 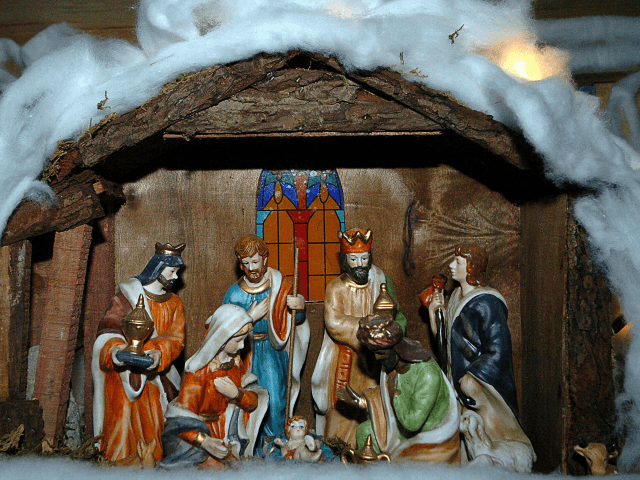 Christmas is NOT about Jesus at all, and I can prove it. In fact I do so in detail here. If you visit that detailed compilation of historic and biblical facts you will find that Christmas is about the worship of the Sun, moon and stars. And so now that the majority have accepted Christmas as a so called Christian holy-day we can see Rome's plan worked. They literally have spiritual control over the masses as we speak. But no one knows about it because most don't read Bibles. Since the people let them remove Jesus from their Pagan doctrines long ago, removing their fake version of Jesus will be just as easy. Simple reason being is, there is no power in their version of Jesus because it's NOT HIM. Don't believe me? If Roman Catholic President John F. Kennedy was still alive I would have you ask him why he outlawed all prayers to Jesus Christ in all American schools back on June 27, 1962. He as well as his Vatican prelates knew that if you get Jesus out of the schools, those children will become adults with a Vatican inspired faith, and with that weakened they will be able to get Jesus out of society as well. Look around.. it's been 54 years since they removed Jesus from the schools. Society look any better since they did that? Now do you see why they don't want Muslims being reminded that Jesus exists? If it worked on actual Christians in America so as to have more control over them via the Vatican controlled churches, it will work even better to prevent Muslims from seeking Jesus as Lord in the first place. Trump picks ANOTHER Roman Catholic for his administration (he is Catholic) * 11 reasons not to trust Obama's CIA * State abandons gender mandate for churches * More violence feared as officer's trial ends without verdict * U.N. claims plan will eliminate graft – worldwide * VIDEO: 6 days, 6 Georgia officers shot * VIDEO: Police officer shot in north Nashville; Suspected gunman found dead * Report: VA staff left veteran's body in shower nine hours, tried to hide mistakes * Repealing Itself? Only Four of 24 Obamacare Co-Ops Remain Open * FYI: New 'nasty' ransomware encourages victims to attack other computers * VIDEO: Why was this allowed in School? !